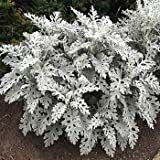 Dusty miller plant growing subshrub of the genus Jacobaea also known as Jacobaea maritime, Dusty miller plant perennial evergreen or annual used as ornamental drought tolerate plant, can grow in mediterranean, desert, subtropics or temperate climate and growing in hardiness zone 8-11. 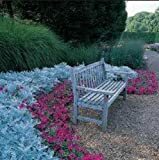 Leaves color slivery-white in lobed to deeply lobed the leaves cover with hair like velvet. Flower color is yellow the stamens and the petals, the flowers grow on stems in clusters. 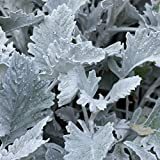 Heirloom 75+ Perennial Flower Garden Seeds - Dusty Miller - "Silverdust" Silver Foliage!